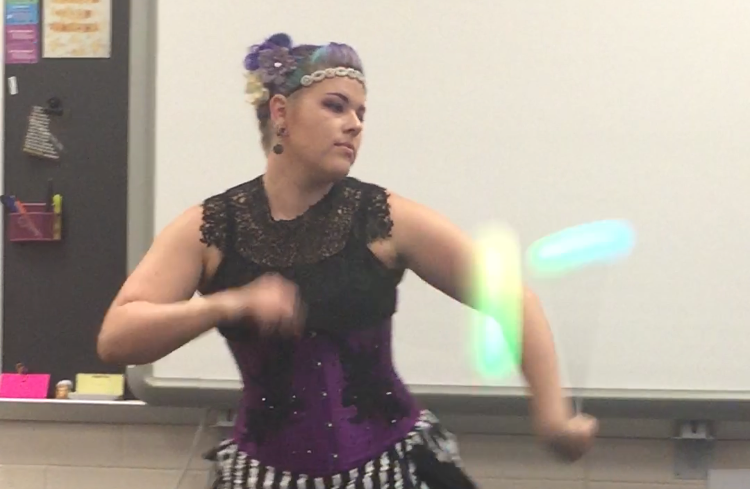 On March 27, guest presenter Krystal Younglove came to teacher Sarah Buttiens’ drama class and told the students about her life as a performer of the circus arts and taught them some of her skills, specifically poi. She first did a demonstration with an animal trap. She set the trap and set it off with a bundle of spaghetti first, snapping the strands into pieces. 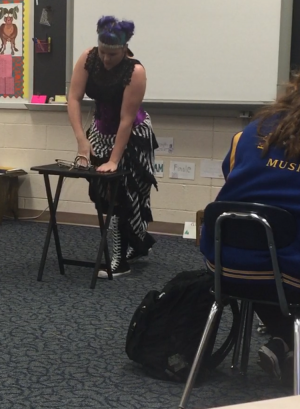 She then reset the trap and talked to the class about her profession as she repeatedly teased the class by almost hitting the trigger with her hand. When she had the class sufficiently uncomfortable, she snapped the trap shut on her hand and the entire class winced. After this initial presentation of her “Indestructible Lady” performance, she told the class that she was a professional entertainer that moved from California to Pennsylvania a few years ago. She attended a performance arts school in California and there started her own circus troupe. Her first skill she learned was fire dancing, specifically poi, a type of fire dancing in which two wicks attached to chains are soaked in fuel, lit, and spun around by the ends of the chains. See here. She then branched out and became the indestructible lady when the troupe had to kick out their current strong man. Currently, she lives in York and works as an independent performer. Among her many talents as a performer she does: fire dancing, the indestructible lady act, hoop work, aerials, and stilts. She then spent some time explaining the role of being an independent performer who is her own boss. 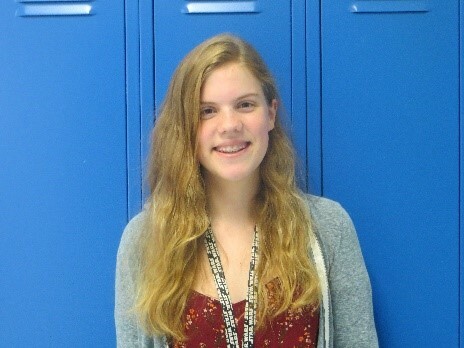 She stressed the importance of networking and the role of social media, not only used to spread the word about her career and get job offers, but also to learn new skills she could perform. Finally, she spoke of the concept of conventions, which exist for all kinds of careers, and how they are a great opportunity to meet new people, learn new skills, and even try out for other circus troupes. After this initial introduction, the students asked her questions about whether she had ever had an accident during a performance and how to become a professional performer. Her best advice was to not panic. In the event of anything going wrong or awry, stay calm and resolve the situation quickly. Panic can and will make things worse. She also encouraged students to look into different schools that can teach you performance tricks, one specifically being in Lancaster. 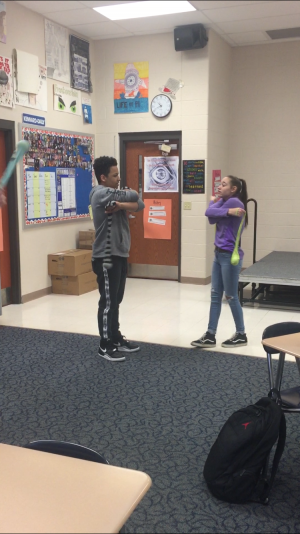 After all the students had a chance to ask their questions, she prepared to do some interactive learning, by teaching students the fundamentals of poi. While there were no fires on strings, she had each student grab two long socks with tennis balls in them to practice learning some poi techniques. “It was really nice of her to teach us how to fire dance, she even made the equipment for us,” freshman Kaytlyn LeBrun said. She taught them a forward spin, and backward spin, a cross, and a weave and did a short demonstration with practice poi (that were not on fire) to show them what they could work towards. Click here for videos of students practicing/participating in the tutorial. Overall, students enjoyed the guest speaker and took away a new potential skill. “She was pleasant and open, and her act was impressive. She was impressive. She was informative and introduced a new art, fire dancing, that I ended up looking more into,” said Alliance treasurer Benigna Polanco. Younglove was excited to come to the school and share her experiences with the students. “[McDunnel] asked [me to come], and I’ve never had the opportunity to spread the knowledge to young people who had the opportunity to try these things and really dedicate time to it,” she said.